Headed down to the closest ranking tournament for the venue of the year for me at Bunn Leisure Park at Selsey. It was a trip where my thoughts of the desperation for qualification for TV comps were a long way from my mind. 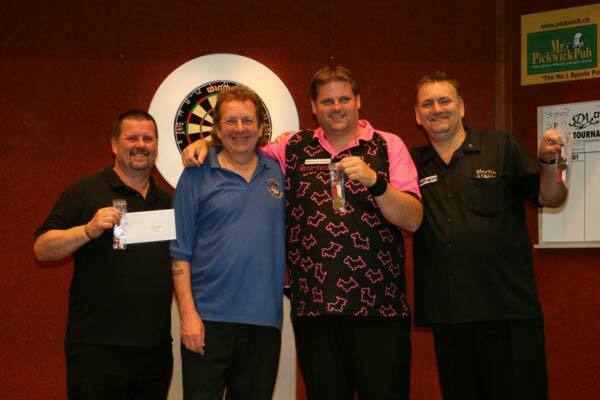 With a top 16 spot in the Winmau World Masters secured at no 11, a Zuiderduin Masters spot secured at no 6 and Lakeside World Championships spot secured as a seed in top 16 the drive was all the more pleasant. Your goals for the year are to make the tv stages of the three Tournaments that are screened. I've done that so the hours of travelling, time off work and getting home in the early hours of the morning have paid off for me. I'm one of the fortunate ones and always have a thought for some of my other fellow players who over last few weeks or next few days will see their efforts to qualify through the system have all been in vain. Some won't even be in the qualifiers for the Masters or the Lakeside World Pro in Hull in a few weeks. For those that are these difficult qualifiers are their last chance saloon. I arrived for the Early Bird comp on the Fri evening wondering if I'm gonna get a stinking draw I usually get there. Yep I did I got Dutch Jimmy Hendriks. Jimmy's weekend was always gonna be about the Saturday singles being one of those who on the tail end of ranking points table battling for a Lakeside spot. Although the tent was cold and a bit of draught but had we had the weather we experienced the week before down south it had been OK. Although conditions were not ideal for darts we had a good match. Unfortunately I was on the wrong end of a 4-3 but missed doubles had cost me badly with 3 darts at a double 1st in 3 of the legs Jimmy won. Still happy with the way I played I headed of for an early night. James Wilson of Yorkshire beat Stephen Bunting in the final. I'm sure not many people know James was born in Weston-super-Mare went on to win the Early Bird Competition. Not many people know that James back in the day, was a star prize winner on Bullseye. Having seen the said show repeated on challenge tv with his mum answering all the questions and hitting 85 on the 101 or more, we can see where his talent for darts was inherited from. I met his Mum too this year at the British Open. With the points chasers needing a good England Classic singles draw, as always there were couple I'm sure the players just did not want Wayne Warren v Jeffrey de Graaf, which Jeffrey won. 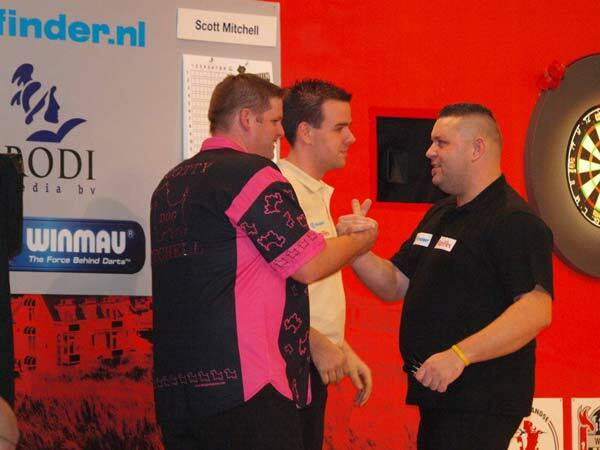 Willy van der Weil v Scott Waites which Scott won. I won my 1st match 3-2 against Paul Roe of Berkshire. At 2-2 we were having a good game but the last leg was a rather scrappy affair, but if you win them, they don't feel so bad. After having a bye 1st rd and winning I found myself in last 128. Martin Phillips my Red Dragon team mate was to be my next opponent. We were to play on the TV lane. Some like the TV lane and some don't. I like playing on it. I think the live stream is a good thing. Commentary is done well by Richard Ashdown and Bobby George so I'm sure it's entertaining and informative. Some forget it's not supposed to be trying to replace any TV coverage or their standard but a chance for the viewers to get a look at some tournament action. It is getting better and people do enjoy watching. Back to the match. I won the bull up and after 1 missed dart at tops for 76, Martin took the 1st leg, Second leg Martin took with the darts so I went 2 legs down. The 3rd leg I shot a 156 to take the leg. Although I'd hit a 180 in last leg sat on 40, Phillips shot out to win match 3-1. I'd had a high 29av and Martin a High 28av. Martin ended up being knocked out in last 32 by Richie George my pairs partner in last 32. 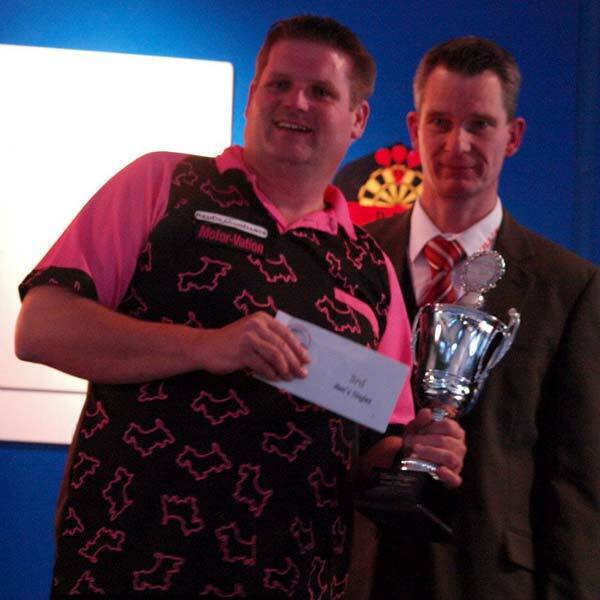 Martin's wait for confirmed qualification for Lakeside goes to the last ranking competition next weekend in Romania. Lovely fella and proper Legend so I wish him luck for that. We ended the singles down to 4 to play in the staged finals on Sunday. Martin Atkins would play Glen Durrant and Scott Waites would play Isle of Wight's Tony Broughton. Saturday still held plenty to play for as the Men's pairs started. I was playing for the 4th time with Red Dragon team mate Richie George. We had bit of success the 1st 3 times as we had made last 8 at Granite City, a semi-final in Belgium Open and lost in final to Waites and Thompson in British Open final in Bridlington. We started slowly to say the least but eased by Welsh lads M.George and G.Dryer 3-0. Next up was two lads from the North East, Alan Edwards and James Forester. Alan was stand by man for the Matchplay to be played on the Sunday at no 9 in the England rankings. They took a 2-0 lead but a scrappy 3rd leg changed the match. We were leading comfortably when Richie went for the wrong shot. The chalker was leaving the shot left in the centre and the shot scored on the outside. So chalking backwards where us southerners are concerned. We got it eventually and went on to win 3-2 after going for the wrong shot a further 2 times. Next up were Ash Khayat and Sam Head. Two under 21 starlets who I'm sure we will hear plenty of in the future. It was not their day as we punished a few bad scores they had, to win 3-0. Gary Robson and James Wilson were our next opponents. Slow starters again and we go 2-0 down but a last 16 darter saw us through 3-2 winners but Robbo still had 1 dart at double 7 to win match. Life was not getting any easier as we played Gary Stone and my Dorset Managers player of the year team mate Ben Ward. In time honoured fashion we went 2-0 down for a change !!!!! We battled back with a great 3rd leg and with Ben missing 3 darts to knock us out I hit double top to take it down the last. We made no mistake of our chance to take the match and went through 3-2. 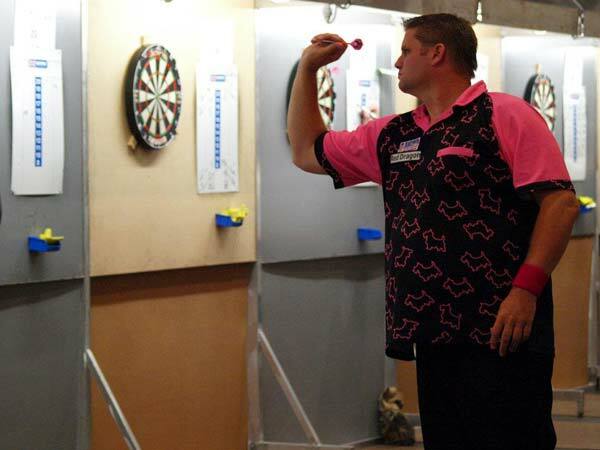 The semi-final was a repeat of the British Open pairs final 2 weeks earlier against Scott Waites and Garry Thompson. We won the bull up and took the 1st leg with myself hitting double 10. Second went to the Yorkshire pair. The third again a scrappy leg and with Waites missing double, Richie shot out. So 2-1 up and the 1st 4 throws were nothing under a ton. Thompson had missed 2 darts to take the leg and sat on tops I missed with three darts. Waites then missed double 5 with 3 and Richie shot the double 10. So we had avenged the defeat of 2 weeks ago in the final and headed to the final on the Sunday. The Sunday soon arrived with rain and cold winds which made the three's in the marquee very testing. I was playing in the 1st ever England Matchplay with the top 8 men from the England Darts rankings. There was a ladies event too with the top 4 from the ladies ranking. Glen Durrant seeded no 1 played Scott Waites (8) up 1st at 10:30am. Unfortunately the early start and weather meant the first round was played sadly infront of only a handful. This was streamed live on the web too. Glen had continued to play as he had all day on saturday and eased by Scotty too Hotty 5-2. Garry Thompson (4) played Paul Hogan(5) and a tight match saw Hogan win 5-4. James Wilson (2) played me (7) and at 4-3 down I missed 3 darts to take it down to the last leg. So lost out 5-3. I'd encountered problems with a draught sending my darts in the board Taylor esque which is not how I throw at all. I'd told caller Nick Rolls I was having problems in leg 1 but wanted to continue as not wishing to put James off. I asked James after the match was he having problems and he said yeah mate but I was winning !!!!! Some sound advice from Mr Too Hotty "you wear pink and throw like a girl so your gonna have trouble with draught". I've taken these tips on board and I'm now going to be wearing the manly colour of purple violet !!!!!! Martin Atkins (3) played John Walton(6) with Assassin winning 5-3. It was on to the Ladies and Lisa Ashton (1) played Zoe Jones (4). Zoe ran out worthy winner 4-3. The second Ladies game saw Deta Hedman (2) play Trina Gulliver in a game of few chances and 4-1 win to Deta with a 30.81 av. This was higher than any of the previous mens matches and Trina had a not too Shabby 27.35 av. The men were back up with Durrant beating Hogan 5-1 and Wilson losing out with a 30 av 5-4 to Atkins. So we were at the finals with Zoe playing Deta in a nail biter, but the averages were not the best as the tenseness of the match saw them stuggle to finish on a couple of legs. Red Dragons Zoe Jones was crowned Womens Matchplay Champion with a 5-4 scoreline. Well done to Zoe. Men's final was final match of the Matchplay with a thrilling final between Atkins and Durrant. It went eventually to Martin Atkins 6-4 crowning him Men's Matchplay Champion and a Team Red Dragon double. Men's final was final match of the Matchplay with a thrilling final between Atkins and Durrant. It went eventually to Martin Atkins 6-4 crowning him Men's Matchplay Champion and a Team Red Dragon double. All England Classic finals were still left to play plus the Women's and Men's singles semi-finals. I had the pairs final to play in against Tony Eccles and Glen Durrant. Richie had won the bull up. We started the match well and I hit a 180 1st throw but we backed it with nothing of note so lost the leg. So 1-0 down. A good leg against the darts saw us level the score but we were immediately broken back to still be a leg adrift at 2-1 down. Eccles missed 2 darts to take the match leaving me 86 to shoot out on which I managed with my last dart in double 8. With the darts a 59, 60 start we found ourselves staring down the barrel as Durrant and Eccles turned the throw immediately. Eccles hit the match winning double to become England Classic Pairs Champions 3-2. It was another final Richie and I had been on the wrong end of. We left the stage knowing we had given our best and conducted ourselves in a gentlemanly manner every time placed our toe firmly behind the oche. 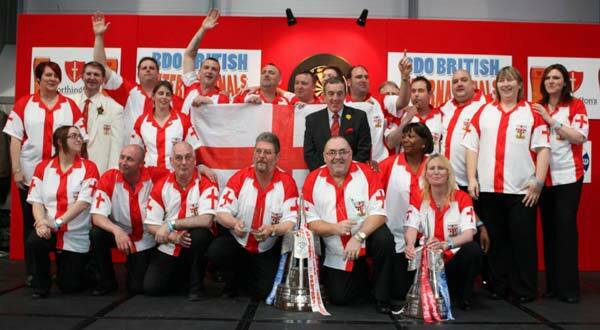 All the results as there are so many names to list can be found on the England Darts Organisation website. Over and out from me for this Ranking season. We all start again in a couple of weeks time. Thanks to sponsors Red Dragon, Motor-Vation Garage, Designs By Sazz who are with me for another season. Welcome to the two new ones for their 1st full season Branksome Carpets and New Queen at Avon, Christchurch public house where I threw my 1st darts ever. British Open held in Bridlington is one of the biggest opens in the BDO calendar. The people of Bridlington welcome and embrace the darts at a seaside town, combined with Yorkshire being a hot bed of darts makes it a special tournament. This year it started with a blind drawn pairs comp on the friday evening as usual but alongside was a mens super 32 singles and Ladies 16, where the top players at the open were invited to enter. This was the 1st of a new idea put together by the Idpa. I was drawn against Dave Prins in round 1 but Dave did not make it so I had a walk over 5-0. The next game was against Steve Douglas which went all the way with me winning 5-4. My next opponent was Red Dragon stable mate Richie George. Those who know Richie will know he plays at a quick pace which I was happy to follow. I came out winner in 5-1 with us both easily doing a 30 average. I now found myself in semi-final against Jay Foreman another of the Red Dragon stable players. Early legs had chances to take legs passed up but again at 4-4 it was bull up which I lost. I missed 2 darts at double 4 for a 68 check when Jay shot out on his next throw on double 10. Jay played James Wilson of Yorkshire and England in the final winning 5-3. It was £50 to enter for me and £25 for ladies at this one. The IDPA are trying to find sponsors to help with the prize monies, which in turn will hopefully see the entries down the line reduced. With having to only win 1 game to get your money back. I believe series will have no problem filling the entry attached to the larger open comps. Pairs were on the Saturday and I paired up with Richie George my Red Dragon team mate. We were drawn in group 1 and won 1st 2 matches 4-0. Group semi was against Yorkshire Pair of Brian Preece and Steve O'Donnell. A tight 4-3 that we could have lost was end result in the match. So it was on to group final and another gritty Yorkshire pair in Vinney Hawksworth and Tom Gregory. We were 3-1 down after an 89 shot in leg 4 on the bull for Hawksworth put us under extreme pressure. Battled back to 3-3 and won the bull up to take the darts and match 4-3. So we had won the group and former England Youth Internationals Jake Jones and Matt Dicken. We raced to a 3-0 lead. One leg Richie scoring 2x180's with myself scoring 100 between them and then shooting the 41 in 2 darts for 11 dart leg. 4th leg we lost after 6 darts to win it but closed leg out in the 5th leg to win 4-1. That put us through to last 4 and to staged finals on Sunday. Sunday was singles day. I had tough 1st rd v Dave Copley. The Yorkshireman on circuit with us most weekends so always a tough opponent. I'm chasing 1 final points scoring box for the year so really not wanting this one early doors. I played like it too. Slow start for both but found ourselves at 1-1 then before I know it I'm 3-1 down after the odd missed dart at a double. So with Dave throwing for 51 for the match I was sat on 96 I did not expect to return. He missed and I shot the 96 in 2 and I was back in it. 14 dart next leg with the darts made it 3-3. I won bull up and finished leg in 17 to take match 4-3. Next was Brian Macloed jnr but I missed many darts at double but squeaked through 4-3. Steve Annan was next opponent and he stood in the way of the 12 points in the ranking and the last box filled. Playing very positive I won 4-1. I played local Scarbrough lad Greame Elvidge. This lad had huge support. They were 6 deep behind the Oche to watch this fella. As he smashed me 1st leg I soon knew why. Got the next back but missed darts at bull allowed Genge as he is known to take 3rd leg. I held my leg for 2-2. Missed dart at 32 saw me having to hold my darts to stay in the match. Missed dart at tops for Greame allowed me to hit double 8 for 3-3. I lose bull and a 180 to start with a 55 from me left me an age away chasing. Genge missed 106 for 12 dart leg and went out in 14 with me sat on 116. Good game happy with my last ranking box. Great support for Genge and really great to me too when I played well. So can't thank the fairness of his supporters to me enough. Proper darts fans !!!! Richie and I had couple hours break and we had our stage semi-final to play against Scottish pair of James Bain and ?. Rich was on fire with his scoring and finishing. We won 4-0 with 31.98 average and I'd had 8 throws (24 darts). 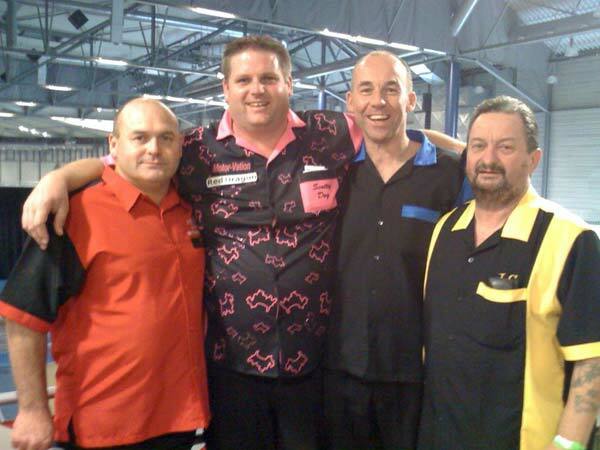 Scott Waites and Garry Thompson were our opponents in the final. 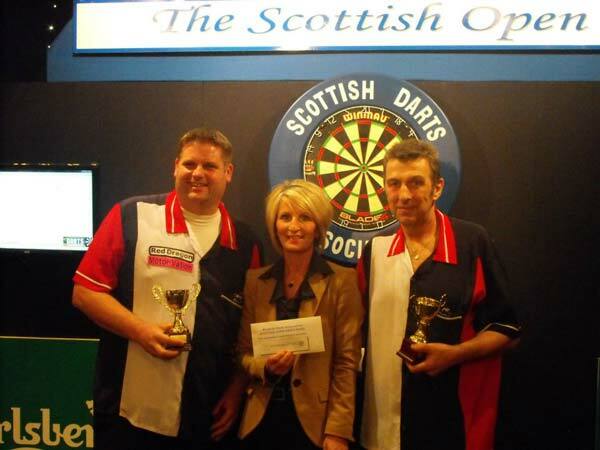 They had beaten James Wilson and Gary Robson in their semi. Little known fact about James is that he and his mum back in the day were on Bullseye and won the lot as his mum as non dart player hit 85 in the 101 for bully's star prize. Anyhow back to the final. Slow start found us 2-1 down but I missed tops with 3 to level match and Too Hotty jumped in to go 3-1 up. I shot 50 to close gap to 3-2 down but with us sat on 40 Gary shot out to win title of British Open Pairs Champion. My report being late I won't say who winners were as you have all already seen them I'm sure. I'm happy as I've made it as a top 16 for the Winmau World Masters Tv stages. I play on the Friday afternoon missing those ultra-competitive qualifiers for those stages to be screened on Espn. I'm now looking good to be at Lakeside 2013 and with 1 tournament to go I'm in good position for auto spot for Zuiderduin Masters on Tv in Holland. Long hard ranking season has 1 month left to run and I can relax a bit knowing it's been a long hard points chasing season, which I looked to have reaped the rewards. Thanks to sponsors Simon at Red Dragon, Gary and Chloe at Motor-Vation Garage, Sally at Designs by Sazz and Spencer at Branksome Carpets. John who does my website big thanks too. Loving support from my wife Sharon and kids Katie and Sam. My achievements are down to you all. You're the fab team that make me. Granite City Open this weekend was a 1st for me. I'd never been to this tournament nor had I ever travelled that far up the British Isles before. So to Aberdeen I headed. There was a little diversion on the way with a stay at George Hall. I was travelling with Red Dragon team mate Richie George, so we had decided to meet there on Thursday and have a practice and stay over and fly up to Scotland on Friday morning. Bobby had been a busy boy. He was decorating one of the rooms and had cut the grass all around the place by the time I had arrived at around mid day. A practice and a lovely evening roast dinner with all family, Richie's brother Robert was there too. He and his family had missed their flight to go on holiday. A guided tour of the lakes after dinner a bit more practice and early bed as we were to be up for 2:30am on friday to catch flight. Derek Weston was at Aberdeen Airport to give us a lift to our hotel along with Deta Hedman and her fella Paul. We were taken to see the new venue for the Granite City Open for 2013. With the addition of ranking points for the 1st time this year the event has out sadly outgrown its current venue. The venue for next year will be superb is all I will say. Aberdeen Exhibition and Conference Centre has two hotels next door to the venue and close to the Airport so can only see the event and entries getting bigger. Do a search on the venue and have a look for yourself. Well done to Derek and his team of people for securing such a classy venue. It was on to the Hotel and an afternoon nap. Then out for evening meal and back to bed by 9pm after what was a long day. Next morning it was up for breakfast and prepare for the days play. A new one to me at this tournament was even though you had entered you still registered between 10am and 11am for toe to the Oche at 12noon. If you were not registered by 11am you were left out of the draw. The draw was then done. This meant nobody had a no show 1st match who had not even been in the venue or area that weekend who had entered weeks before. 1st match I played was Alan Kerr who was left hander who was known to me. Alan did not play the game I'd seen him have in the past but I'd finished very well having 4 darts at 4 doubles to win 4-0. My second round match I was pushed a lot harder and won 4-2. It was Daryl Gurney next in the group semi-final. A shortened re match of our 2010 Lakeside game. I knew it would be tight when it took couple of the attempts to decide the bull up. I hit bull to win it. I held 1st leg after Daryl missed 3 at a double to steal. I missed 2 at double to steal in the 4th. At 3-3 and 140, 60, 140 I felt I had it in the bag but a big 180 left Daryl sat on 92 after 12. I was looking at 84 and missed bull leaving 47. Daryl threw for hit treble 20 and missed 2 darts at 32. I hit 7 and missed tops on the wire and on return Daryl hit 8 with his last darts. Good match but no points for me this time around. One Scottish fella watching bought us a beer and thanked us for our entertainment which was a nice gesture. Richie George won his group but had lost in last 32 to Stephen Bunting who was eventual winner. The next morning (Sunday) we packed as we had to be out of the room by 11am. I checked out and thought Richie had registered us and he thought I'd done it so were very lucky we had about 4 secs to spare. I'd been practicing on board 20 and when they asked to clear the boards I was last in the queue. I was then last in the room throwing so was volunteered to mark over the speaker by organiser. My Scottish darting counterparts enjoyed this and I duly chalked. I was then asked by various players if I'd chalk for them when they lost. Richie and I had a good run in the pairs loosing in the last 8 to Ross Montgomery and James Wilson. Not bad at our 1st attempt. We headed to the Airport to catch our flight home. While going through security I said to Richie "that lady in front looks like Thandie Newton from Mission Impossible 2" (to name but 1 of her movies.) He replied "No its not. What would she be doing here". She then got asked for her autograph by a policeman and a photo with him. So we agreed it was but I did not have the minerals to go ask to have a photo with her. But I will say she seemed lovely, really interested in people who approached her and gave them her time. She sat in departures not too far from us but was not on our flight. Ours was delayed and I have to say it has been my worst year for delays since I've been on the curcuit. I've had maybe 2 return flights this year depart on time. We arrived back at George Hall for 1:30am. Woke around 10am with just enough time to pinch myself to where I was staying again. Richie took me for breakie and left for Dorset to arrive home in the pouring rain. Headed to Selsey and Bunn Leisure, White Sands Caravan Park, for the England Open, on weekend of 23rd/24th, with the hope of filling my 11th ranking box of the year for Lakeside. There were also up for grabs Zuderduim Masters points for the Dutch Tv tournament qualification. The warm up is the Early Bird competition played on the Friday, after a 1st round win I played good friend Steve Hartley from Herts or Buzz as we know him. It was a drafty affair as with the friday weather conditions made the Marquee playing area more like a F1 wind tunnel. None of which helped either player. I was fortunate to have squeezed through this one although the 3-0 scoreline suggested differently. That bought me to a last 32 clash with Deta Hedman. On the bull up there was nothing between us I felt the gentlemanly thing was to give the lady the throw if there was a doubt. Deta thundered in a 140 1st throw it made me think I've changed my mind. She took 1st leg in 14 darts when I was sat on 66 after 12. After 2 missed darts at 40 in the 2nd leg Deta poked a 120 to go 2-0 up. I shoot out 56 to win leg 3 and then miss 2 at 40 with Deta hitting 40 for a 76 shot out to go 3-1 up. I win 4th leg against darts to go 3-2. The next leg I start with 100 and Deta hit a 180. Deta missed a 114 shot for a 15 dart leg. I miss 2 at 24 for an 84 shot out and a crowd four deep saw Deta hit tops to beat me 4-2. She had already beaten Ewan Hislop 4-1 in the previous round, Well done to Deta. I really enjoyed the game. So I've taken a bit of banter via text from Red Dragon team mate Scotty "Too Hotty" Waites. I can't believe he did that with me knowing that he thought he was in the earlybird comp when he arrived but found that he had entered the Money in Money out via the online entries by mistake. With the money in money out being cheaper to enter, I believe it was the tight Yorkshireman inside comming to the fore !!!!! The ranking England Open next morning early rounds saw me play London's Micheal Artiss and Berkshire's Terry Little with me winning both matches 3-0. The next a more difficult match against Hampshire's Martin Harper. At 2-0 up I missed tops to win. Martin stole and then put in a 15 dart leg to hold throw to go 2-2. A good last leg of 14 saw me go through 3-2. My group final I played Dorset team mate Terry Prowse. He has been my county selector for last couple years so with him stepping down from the post I knew it was ok to beat him. I did 3-0 but always tough playing mates at these bigger events. Another Mate in Doug Harwood from Surrey next and a 3-1 win. 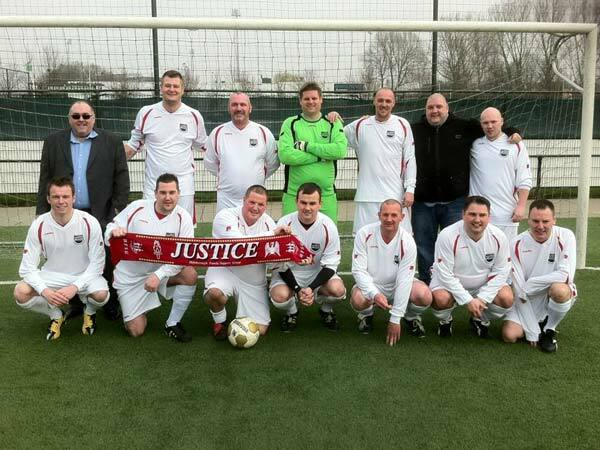 We now down to last 16 and England International teammate Dave Pallet's dad Ian. Last time Ian played me I got thumped 3-1 after I did a 13 dart 1st leg at Welsh Classic a couple of years back. It thankfully did not happen again. I eased past 3-0 with Ian not getting his best game out. A quarter final with Wesley Harms was going ok at 3-3 on the live stream tv lane. We had both won legs we should have lost so pretty even. In last leg I was called over the Microphone from top desk to go play my 1st round pairs match. Total lack of organisation and totally the wrong moment in a quarter final game in a category A tournament just as I happened to be throwing so lost concentration and lost leg. Bowed out at last 8 for 2nd year in a row. Not the 1st time EDO darts has done this to me. Last year in England singles they awarded my last 8 match with Gary Robson to him when the score at 3-3 also. We had been told incorrectly best of 7 but was actually best of 5. Although we had not bulled up for deciding leg they still awarded it. So I'm hoping next EDO darts last 8 will be 3rd time lucky with no mistakes. 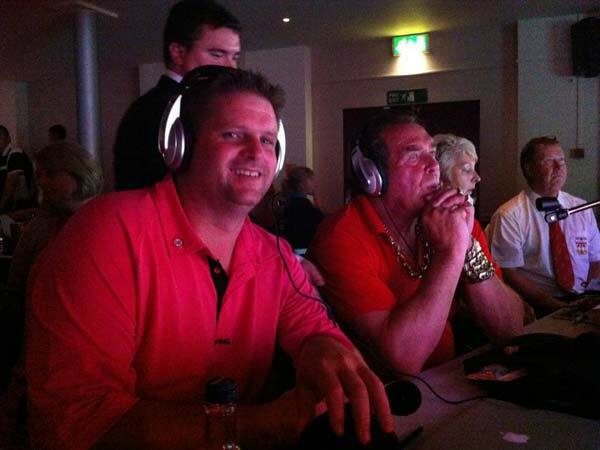 With the live stream being on the internet with commentary I got a chance to co-commentate with Bobby George, Trina Gulliver and Richard Ashdown. Bobby getting plugs in for his fishing lakes and his son Richie's sponsorship of some dart company called Red Dragon !!!! Really enjoyed it as did both Mens and Ladies finals. Anastasia Dobromyslova beating Deta Hedman in a fantastic 4-3 final with a last leg 121 shot against the darts for a 12 dart leg to be crowned England Open ladies Champion. Wesley Harms took a 6-1 win over a surprise finalist and friend Tony Broughton from the Isle of Wight to be crowned Champion to follow hiw Swiss Open title win 3 weeks ago. Next week its on to Granite City Open in Aberdeen and an overnight stay at George Hall as I'm traveling with Richie George. Signing out Scotty dog. Busy 10 days for me with being part of the England Team on 14th/15th April, who won both Ladies and Mens titles at the British Internationals Held at Parc y Scarlets, Llanelli, Wales. England bought in new faces for caps this time around. Two in the Ladies and five for the men. All performed superbly under the pressure or wearing the red and white shirt. Mixed emotions for me. I lost out 3-1 to Euan Callendar of Scotland with a 30.31 average. Then to my old mate (and he is old) Dave Smith Hayes of Wales in a last leg decider 3-2. Dave and Euan avenging defeats from me the past. Quick mention to Merryl Dennis who is a Devon County lass, which is Dorset's next door neighbour county. She shot a 122 in her debut game to win. Up the Southernly. Been invited to be part of the Bournemouth Masters by Modus Darts Events and Management on Thurs September 13th. 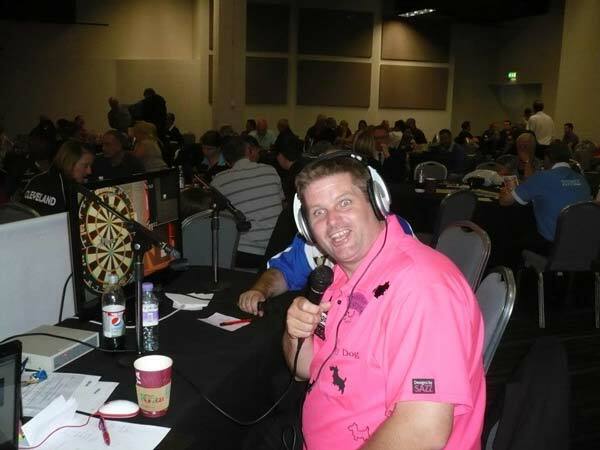 The line up will be Barney, James Wade, Simon Whitlock and Mark Webster and me as a guest. I went to meet Raymond and George Noble (who were in town with Premier League) at the Money Shop on Wednesday to collect more details. I'm looking forward to it already. Thursday was a night at the Premier League at Bournemouth International Centre. Many darts people and friends from across our area were in attendance. Those who know I'm a Big Speedway fan with Dorset's Poole Pirates my team. I got to meet our Aussie riders known to speedway fans as the Turbo Twins, Chris Holder and Darcy Ward. They along with Team manager and former Pirate's legend plus Dorset lad Neil Middleditch, who were all in the spirit of things dressed up as Pirates. I will say Middlo's Pirate boots were what he had worn out clubbing in the 70's, back in the days of his Afro hairstyle. Also met former England Under 19 player and current AFC Bournemouth left sided star Scott Malone. Fun evening. Friday was a flight to Dusseldorf for the German Open which is held up the road in Bochum. Singles were on Saturday. I progressed through to my group semi-final where I played former Scottish Derek Cunningham winning 3-1 and in the final veteran of the circuit and proud Yorkshireman Brian "the mullett" Preece. I squeezed by him 3-2 to leave me in the last 64. Wesley Harms Lakeside semi-finalist was my next opponent. A defeat against the throw at the Scottish Open earlier in the year I was looking to return the Favour. With match sat at 2-2 won the bull up in last leg to win 1st throw and went on to win the match 3-2. German Alexander Raher who I eased past 3-1. Last 16 and it was my old friend former Grand Slam champion and runner up plus current Winmau World Masters Champion Scott Waites. A couple 180's later and sat at 2-2 the all crucial bull up which I won. I went on to win the match 3-2 checking out on 36 for a 17 dart leg with Waites sat on 40. Last 8 I played Dutch Youngster Jimmy Hendriks. The 19 year old had shown his talent by knocking out Jan Dekker in the previous round. We were now on set play so best of 3 legs for a set and best of 3 sets. At 1 set each having both sets gone 2-1 in legs it was to the bull up. Which as I had all day I won. At 1 leg each to with myself sat on 140 i throw to leave 40 and Jimmy on 200 throws 140 to leave 60. I hit double top last dart of the last leg to take the match. Now in the last 4. I'm playing Belgian Geert de Vos who made his debut at Lakeside this year. At 1 set up and 1-0 up in legs in the 2nd I missed darts to win the match. At 1-1 I missed darts to win the match so it went to 1-1 in sets. I lose the bull up for 1st time all day with Vos hitting the bullseye. I steal the 1st leg and have 2 darts to win match in 2nd leg of 3rd set and lose that leg so now 1-1 in legs. It's sudden death with Vos to throw. Vos starts 100 and I start 180 and stayed in front to get 3 darts for the match on 60 which I miss and Vos shoots out 77 to win the match. I'm disappointed to miss doubles and lose the match this way in one of the Major BDO circuit Opens. The bigger picture for me is the race for points to get back to Lakeside and these 20 ranking points will come in very handy come end of rankings in October. In the Men's pairs I reached the final playing ironically with Dutch youngster Jimmy Hendriks. We reached the final beating Lakesider's Robbie Green and Dave Prins, and Scottish Internationals Ewan Hyslop and Gary Stone. We lost out 2-1 in the final against Lakesider's Clive Barden and Steve Douglas. I'd say it ended with more pluses than minuses and a good weekend for the Scotty Dog. Big thanks as always to Sponsors Motor-Vation Garage of Boscombe, Designs by Sazz for my shirts and Red Dragon Darts for all my darting equipment. Pairs - Won in Final with James Wilson 3-1 v Richie George and Jamie Robinson. Wins Welsh Classic Men's Pairs 2012 with James Wilson. The trip to the Isle of Man Open was in my head was that I needed to leave with ranking points in the bag. Singles are on the Saturday and played in the Villa Marina in Douglas. I was drawn in group 32 and bottom half of the group. I mentioned both these things as in the Isle of Man Open this year the 1st name on the match sheet threw 1st. No bull up or no toss of coin till last deciding leg. I understand that it was done to save time in group stages and why, but with where I was drawn meant no matter how far I preceded (even the final) I would not have the darts in the 1st leg all day at any time. As always sometimes happens when you travel a fair distance you draw someone from not too far up the road. I had Sam Allen from West of England which is southwest like Dorset. Sam with the darts took the 1st leg which woke me up a little. I went on to take my next with the darts. Sam missing dart at a double 1st in leg 3 allowed me to steal it. I held my darts to win 3-1 but closer match than score suggests. Couple of matches later I'd won the group so was sat on 14 points in last 32 a happy lad. I was moved from downstairs room up to the main hall where I played my last 32 match and again lost 1st leg but won next 3 to make last 16. I met Jeffrey de Graaf at this stage. I'd played Jeffrey before and lost 4-3. He was no surprise to me he held his throw on the 1st leg. I held my 2nd with a 14 dart leg. Jeffrey did a 16 darter to go 2-1. Bossing the 4th leg sat on 88 Jeffrey scored a 177 from 209 to leave 32. I missed double 7 last dart having thrown 20, and hit 54 to leave 14. My day had ended but Jeffrey made it to the Sunday semi-finals and finals, going on to take his maiden circuit title. So with 16 points and a smile I left the venue on Saturday. Sunday I played pairs with young Dorset lad Carl Beattie. We started nervously but finishing tidily and continued to do so as the day went on. We found ourselves in the semi-finals against John Boy Walton and Martin Atkins. With the lads having double trouble we stole the 1st leg hitting tops. The second leg we started with a 100 and then neither pair hit a treble till I hit 152 shot to win the match. Another pairs final against Tony O'Shea and Dutch youngster Jimmy Hendriks. We were soundly beaten 2-0 by a 34 avg. Returned home with those 16 points and a pairs final pleased as feel now my blood sugar levels getting better by the day I'm heading in right direction with those and my darts. It's on to Mariflex Open in Rotterdam next. After failing to score ranking points at the Dutch open, the same happened at the Scottish Open. Although Scottish I lost to Wesley Harms 3-2 I still had no points. My game had started to show signs to a return to something near where I was in the few weeks before being diagnosed Diabetic. The following day in Scotland I had lost in the open pairs final with my regular partner of couple seasons ago Ex England International and mate Roy Brown. Well Lakeside 2012 has come and gone for me. A few missed doubles and some great finishing from Martin Adams currently 3 times World champion and the dream gone for another year. The harsh reality for me is the 12 months hard graft travelling was over in 27 minutes. It was the draw I wanted feeling being the underdog tag would help me. Had I not run Martin close in Zuiderduin Masters on tv a month ago, I think it would have. Those who know me should know I'm not a doom and gloom merchant when I've lost, so will try to take positives from a match, so the missed 130 in the penultimate leg pressured Martin on double for him to win the match, which he missed. I then missed double 5 leaving 5, I hit big number 1 and double 2 under that pressure is positive for me. The 136 to save the match, to hit the 2 treble 20s again to give me a chance to save match for 2nd time under the pressure pleased me too. Also for a player with the magnitude of such a game, until you watch the match back, your feeling is you have played a whole lot worse than you actually have because you've lost. Despite the outcome of the match, the Lakeside fans are fantastic and don't allow you to be down for long. I will return on and off for the rest of the week as a fan to support my dart playing family, who will all be doing their best to provide genuine entertainment to genuine dart fans. I travelled with couple of my Dorset county team mates to Top of Ghent, where the venue was fantastic. We were playing in an indoor Athletics area that was so well suited too us darts athletes!! I had a good run in the singles but drew one of my mates Rich Perry 1st match, which is ironic after travelling all the way to Belgium with him. Luckily I scraped by him 4-2 and then ended up playing and beating ex England international Steve McNally in last 64 4-3. In last 32 I played Belgian International Stefaan Daenekint and won 4-3, which was great as I came back from 3-1 down. In last 8 I played young Dutch lad Jeffrey de Graaf, and I got myself to 4-2 up on a 1st to 5 and then was hit by a whirlwind of 12, 13 and 12 dart legs to loose 5-4. What made it worse was that on the 13 dart leg I'd left tops after 12 darts, so what a talent for the future Jeffrey is. Overall really happy to get my 1st points for Lakeside 2013 qualification. I'd like to say a massive thank you to the event organisers for a fantastically run tournament, and lovely meal in the Ghent Irish Bar Patrick Foleys. The BDO Tour moves on to Czech Open in a couple of weeks in our quest for more points.